As far as we know, The Donald is a U.S. citizen, and thus protected by our Constitution, Bill of Rights and subsequent constitutional amendments. As a public figure, The Donald ought to realize that what he says may be interpreted literally or figuratively. Some of his recent comments directed toward Mexicans seem to have energized a group of fellows who are no longer able to fly their Confederate Flags as openly as before, and had been seeking some new causes to help rally the troops. Mr. Trump has recently been quoted making alleged negative comments directed toward migrants from Mexico (and Central / South America) as a primary contributing cause and source for America’s multiple issues with drugs. I’m not quite sure what The Donald was trying to tell us, but it is pretty clear that the propensity for U.S. citizens to use “recreational substances” – alcohol, marijuana, peyote and others – predates Mr. Trump. Prior to 1913, about 40% of federal revenue was generated by taxes and fees on alcohol. Passage of the 16th amendment in 1913 (which created the federal income tax) addressed the ‘tax issue’ dependency relative to alcohol, and thus paved the way toward Prohibition. Subsequent to the 16th amendment, income taxes far surpassed liquor taxes, providing solid support for passage of the 18th Amendment – a.k.a. “Prohibition” – in 1919. It banned the ‘manufacture, transportation and sale of intoxicating liquors’. The 18th Amendment didn’t stop the manufacture, transportation or sale of booze — it just shifted the activities out of the mainstream economy to the underground economy, where there were plenty of domestic cartels (families, gangs, mobsters, etc.) ready, willing and able to step in and ensure that the supply chain wasn’t interrupted due to some foolish Constitutional Amendment. At the time, most of these cartels were populated by first or second generation immigrants from Ireland and/or Italy. Since those peaceful days, direct descendants of the Hatfield and McCoy families have joined forces to make and distribute what some consider to be one of the finest of American products, “The Drink of The Devil” — carefully made in small batches in West Virginia, and fully taxed. For decades, our elected officials have pushed marijuana (and some other goods and substances) out of the mainstream economy and into an off-the-grid cash economy where no taxes or fees are collected, and thus any and all costs associated with oversight, enforcement, etc. are fully borne by those of us who obey the law and do pay taxes. All of this, Despite the lessons we learned from prohibition! Today, many corporations have taken their manufacturing, packaging and more menial tasks “off shore”. Why wouldn’t the domestic marijuana and narcotic distribution cartels follow suit? Somewhere at the top of any of these current distribution networks is a domestic descendent of one of the original “Capos” – carefully managing his supply chain, and working very hard to ensure that his lifestyle is such that he is above suspicion. Dig a little deeper, my friends. This story really has nothing to do with people from Latin America who grow, manufacture, package and/or ship ‘illegal substances’ to the U.S. The real story is right here, and hiding in plain sight: Which of our neighbors has been blocking legalization and domestic control over the distribution and sale of marijuana? These are the people who have the most to lose once marijuana becomes part of the regulated, taxed and mainstream economy. Where is The Real Donald Trump hiding? Yet, the questions remain: (1) Who is The Real Donald Trump? And, (2) Where is he hiding? I don’t have enough information to delve into Q1 (at this time). 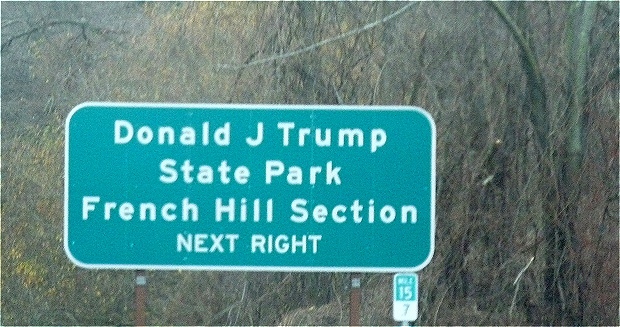 Driving north out of NYC on the Taconic State Parkway, you will see the sign announcing the DJT State Park just before mile-marker 16. The sign was erected in 2006 at the twilight of George Pataki’s final term as NYS Governor after The Donald donated some 436 acres of vacant land in the towns of Yorktown and Putnam Valley to the state of New York to be used as a park. Turns out that the Park never quite got started (or finished), quite similar to several other projects The Donald announced with great fanfare and plenty of publicity. Now, please understand – The Walrus is all in favor of open space. In fact, if The Donald had donated this property to NYS as Open Space, I might have a somewhat more favorable impression of him and his character. Trump had assembled this land in the early 1990’s with the expectation he would create one or more private golf clubs. His cost of acquisition was somewhere in the $2 Million range. After being rebuffed by several government entities on the potential negative environmental impacts of shoe-horning private golf facilities into wetlands, wildlands and woodlands, in 2002 Trump – with great fanfare – declared that he was “fed up with” governmental delays and overreach. He stopped the application process for the golf course; and began marketing the property as a potential site for luxury housing. By 2006, it was apparently clear that the property was: (a) over-priced, or (b) not suitable for development, or (c) all of the above. So, instead of selling the property, which he valued at $100 million, Trump decided to donate it to the state of New York to be used as a park. The bad news: the cost of converting these 400+ acres of wilderness into a state park, maintaining it and staffing it was beyond the realm of comprehension. Meanwhile, we’ve determined that The Donald isn’t hiding in Donald J. Trump State Park, because there really is no such place which is accessible by motor vehicle, only on foot or by helicopter. And, we’ve been able to determine that The Donald is not hiding at his daughter Ivanka’s estate. We’ll keep searching for The Real Donald and where he is hiding, so please feel welcome to send any tips or leads to The Walrus! Rev. Al Sharpton used the 1987 Tawana Brawley case as his chariot to infamy. A grand jury was convened in the Brawley case to investigate claims against six white law enforcement officers who were accused of heinous acts against Brawley, then a 15 year old African American girl from Dutchess County in New York. In October 1988, after spending seven months investigating the case, the grand jury concluded that Tawana Brawley was not abducted, raped, or sodomized, and no charges were brought in the case. Outside the courtroom, Sharpton used his well-developed preaching skills to help sensationalize the Brawley saga and spin it up into a bigger than life phenomenon which occupied the national press for several months and which widened the chasm of distrust and loathing within the black community toward law enforcement officials. Fast forward to 2014: He seems to be at it again! The recent tragic death of Eric Garner deserves to be fully investigated and tried in a court room before a judge and jury. Observing Sharpton’s continuing public behavior relative to the circumstances, facts and emotional components of the Garner case drew me right back to 1987, and what seems to be a mad dash to try and decide the case in the ‘court of public opinion’. True leadership requires a focus on the big picture and on strategies to move the needle in a sustainably positive direction. A true leader must be committed to transparency, honesty and integrity in all of his actions. I see no evidence of strategic thinking or progressive action coming from Rev. Sharpton, and that leaves me feeling very uncomfortable, indeed.